Wholesale Trader of a wide range of products which include dg synchronization panel. We are specially designing and developing a wide range of Auto Synchronizing panels. We manufacture Relay based as well as PLC based synchronizing panels as per our customers’ requirement. In relay base Synchronizing panel we use a control & protection relay of leading company CRE France. Our panels are use for Alternator synchronizing between various Diesel Generator sets, Gas Generator sets, and Turbine generator sets. And also use for entire power system synchronization with Grid as well. Our panels are use in both LT & HT System. These panels are fully automatic as well as manual provision also. 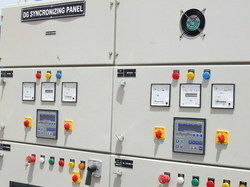 Looking for Synchronization Panel ?